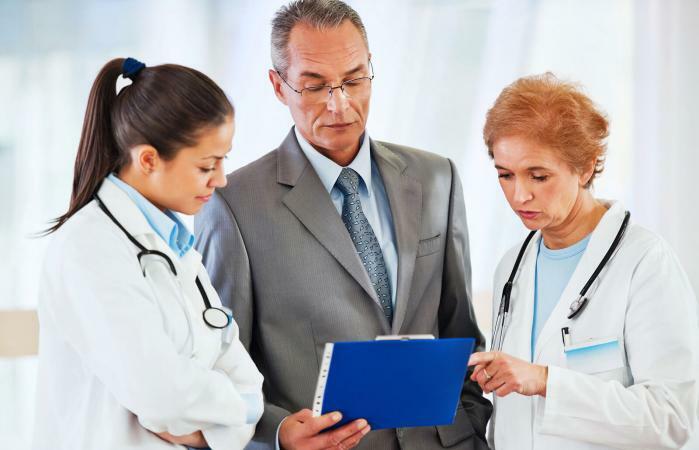 Whether you're thinking of a career as a medical office manager or you're looking for a sample document that you can use as a starting point to create a job description for use in your company, an example can be very helpful. Medical office managers perform a wide variety of administrative functions in medical practice settings. While the exact duties required aren't identical for every medical office, you can get a good idea of what's generally involved in this type of work from reviewing the printable sample document provided here. To access the sample document, simply click the image. The document will open as a PDF file that you can review on-screen or print. To print, simply click the printer icon in the menu bar, or select "print" from the "file" menu. You can also save the document to your hard drive or external storage device if you'd like to reference later, simply by clicking the diskette button on the menu bar, or choosing "save page as" from the "file" menu. You can make changes to the document, customizing it for use in your company. To change text, simply click in any line and type over the part you want to change. If you do make any changes, be sure to save the document again once you are finished. 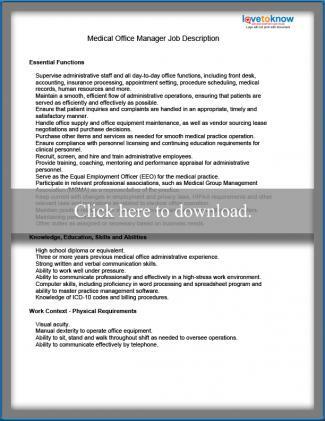 Download a sample medical office manager job description. Keep in mind that job descriptions may vary significantly from one organization to another, even when the job titles are the same. If you're looking for a job, avoid making assumptions. Keep an open mind and ask questions about specific requirements of the job for which you are applying when invited to interview. If you're creating a job description for the medical office manager in your practice, adjust the text so that it is specific to your organization. Reviewing additional management job descriptions may also be helpful. A wide variety of factors impact job expectations, including practice size, whether or not there is a practice manager at the company, and how involved the clinical staff is with day-to-day operations. Don't assume that every item included on this sample will be part of every position, or that some jobs won't require tasks not listed here.